Cézanne’s final style, featuring his characteristic ‘constructive stroke’ with patches of colour built from groups of parallel brushstrokes, came to dominate his oil paintings by the mid-1890s. It is this style which has been claimed as laying the foundations for Cubism and abstraction. As I have pointed out, such experiments with different ‘facture’ were common at that time, with Pissarro, Seurat, Signac and others reducing their brush marks progressively until they became the tiny dots of ‘pointillism’, for example. However grand claims have been made about Cézanne’s paintings of this time, and in this context the claims need careful consideration against the evidence of those paintings. The first claim, which extends back into earlier styles, is that his paintings appear flat and without conventional cues to depth. This was claimed to be part of his rebellion against the conformist painting of the academy and salon of the time, and a mark of his ‘primitivism’. Relative size is a feature maintained throughout Cézanne’s paintings, and seen clearly in the examples shown here. Height in the picture plane is also maintained throughout, and shown here. Overlay, occlusion, interposition, and superposition are maintained throughout, and shown here, although I have found a couple of small inconsistencies in depth order in his paintings during his Impressionist period. He also used the framing technique of repoussoir throughout his career. Illumination and reflectance edges are often lacking, even in his still life paintings, although they are more typically accomplished using colour rather than tone. Shading and shadow are also often lacking in his landscapes, although shading effects may be accomplished using colour rather than tone/value. Aerial perspective is usually present, although sometimes it is less conventionally achieved. This is most apparent in his paintings of Montagne Sainte-Victoire, perhaps, where the distant mountain is invariably different in warmth and/or hue to the middle- and foreground. Figure-ground organisation is also generally well marked, although occasional passages can become very indistinct. Linear perspective and outline shape are difficult to assess in landscapes which lack regular architectural structures close to the viewer. However it is not correct to claim that Cézanne did not use linear perspective, as his very late paintings of Jourdan’s cottage (oil and watercolour), and several earlier works, show. 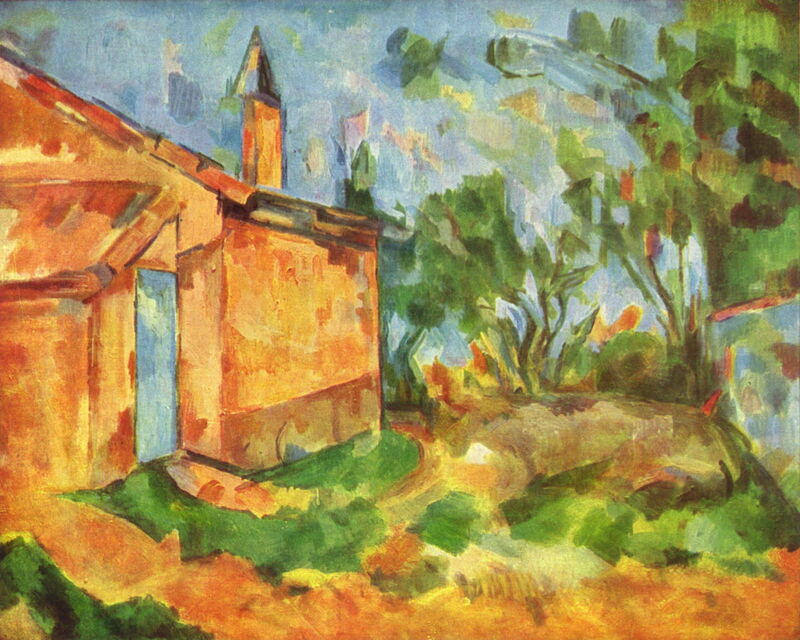 Paul Cézanne, Le Cabanon de Jourdan (1906) Rewald no. 947. Oil on canvas, 65 x 81 cm, Galleria Nazionale d’Arte Moderna, Rome (WikiArt). 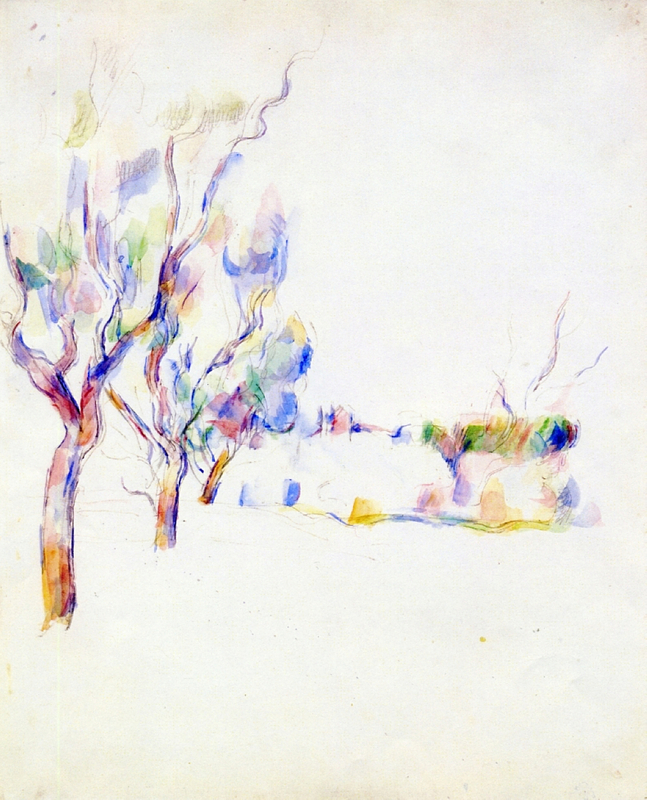 This, and its very similar watercolour version, displays quite conventional linear perspective, despite being painted close to Cézanne’s death. So whilst Cézanne’s late style may weaken perception of space and depth in two of the classes of cues, it is quite consistent in three of the more important classes, and usually exhibits two others. If he was trying to make his paintings appear flat and without depth, he was not trying particularly hard. The second claim is that he was not interested in the outline forms of objects, merely their colours. For much of his career, including his later years, Cézanne’s oil paintings contain dark (usually ultramarine) lines indicating the edges of objects. Whilst he appears to have used these to help him form the coloured areas representing those objects, he seldom painted over them, but left them clearly visible to the viewer. Indeed careful examination (for example, that of Elisabeth Reissner) reveals that he often restated these lines during the painting process, sometimes adjusting them with the evolving composition. He did not explain why he did this, and its pictorial effect can only be to emphasise the outlines of forms. Drawn lines, normally using a graphite pencil, are also a prominent and distinctive feature of his watercolours, including those which he painted in his later years, increasingly in preference to oils. Those watercolours are normally so unlike his oil paintings that they might have come from a different period, or a different painter altogether. They contain extensive areas of white ‘reserved’ space, and scattered flares of raw colour. Although the graphite drawing was generally laid down first, he also redrew in graphite over paint on many occasions. Paul Cézanne, Almond Trees in Provence (1900). Graphite and watercolour on paper, 58.5 x 47.5 cm, private collection (WikiArt). Cézanne turned increasingly to watercolours in his final years, leaving large areas of white ‘reserved’ space, and applying scattered flares of raw colour. I have not seen any consistent account of Cézanne’s late works which embraces both his oils and watercolours, and Cézanne himself did not appear to explain their differences either. However those watercolours are clear in making the outlines of objects such as trees very visible, if usually depicted by a bundle of curves rather than a single line. 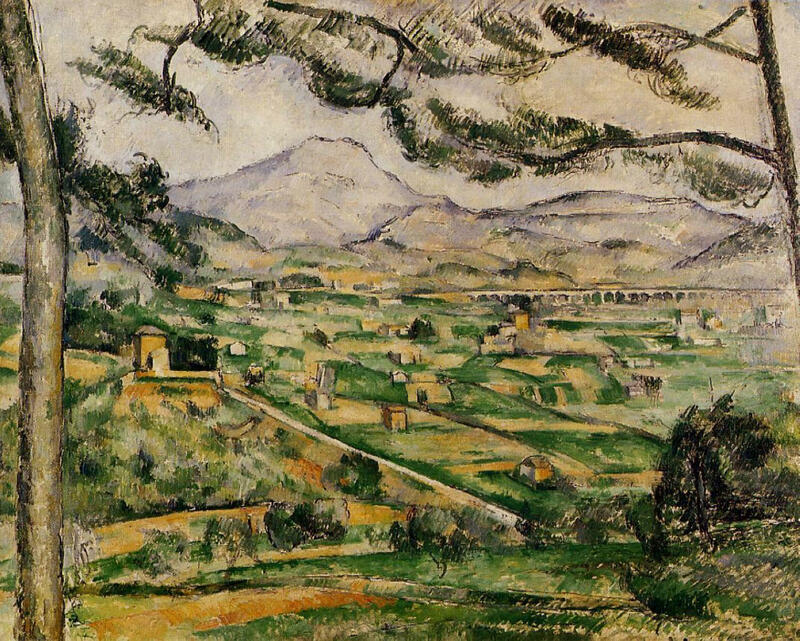 Paul Cézanne, La Montagne Sainte-Victoire vue de Bibémus (1897) Rewald no. 837. Oil on canvas, 65 x 81 cm, The Baltimore Museum of Art (The Cone Collection) (WikiArt). Although the rocks of the quarry in the foreground might appear abstract, they match the forms seen in the motif. The third claim is that his paintings became increasingly distorted and abstract over time. Cézanne’s own writings make it abundantly clear that even in his final years, he was striving to create paintings which were parallels to nature, in the tradition of Poussin for instance, and not abstract in any sense of the term. 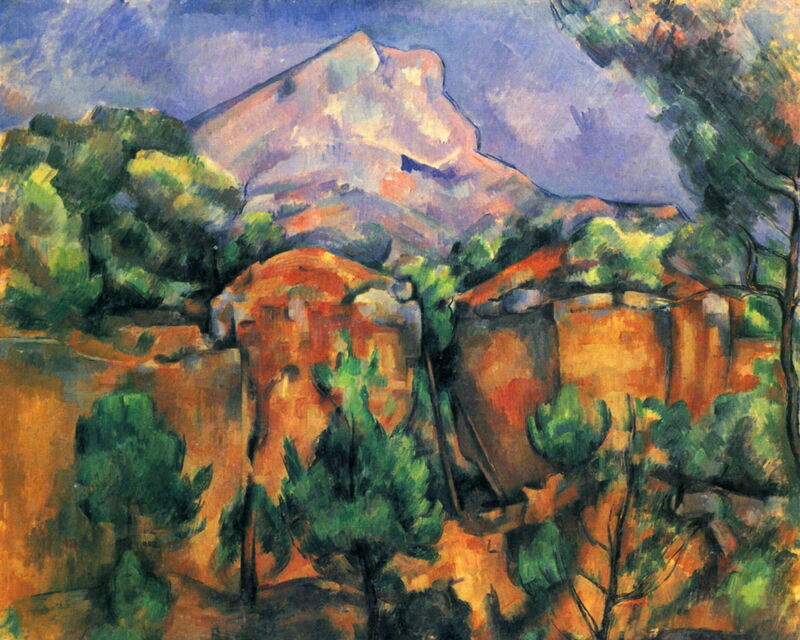 Later critics and artists seized on those works showing unusual rock forms and geometries in the Bibémus Quarry, but the careful studies of Rewald, Machotka, and others have allowed comparison with the rock faces in that quarry, and confirmed that Cézanne was depicting them quite faithfully to nature, and neither becoming Cubist nor abstract in his style. One significant factor which has often been overlooked is that during the nineteenth century, with the advent of photography, people were starting to see images with angles of view and geometries quite different from those of the human eye. I suspect that his famous ‘telephoto’ compressed view of the village of Gardanne (‘vue verticale’, 1886, Reward no. 570) is a product of that new way of looking. On the other hand, claims that Cézanne was suffering from severe deterioration in his eyesight because of his myopia or the diabetes from which he suffered after about 1890, are not supported by the evidence of his paintings. Like most uncorrected myopics he must have found it hard to paint plein air under the dazzling Provençal sun, and he wrote that he had to stop painting by the middle of the morning because of this. However his works continued to show as much distant detail as they did in his earlier career, and they contrast with the effects seen in painters with myopic problems. Paul Cézanne, Bords d’une rivière (1904) Rewald no. 925. Oil on canvas, 65 x 81 cm, private collection on deposit at Kunstmuseum, Basel (WikiArt). 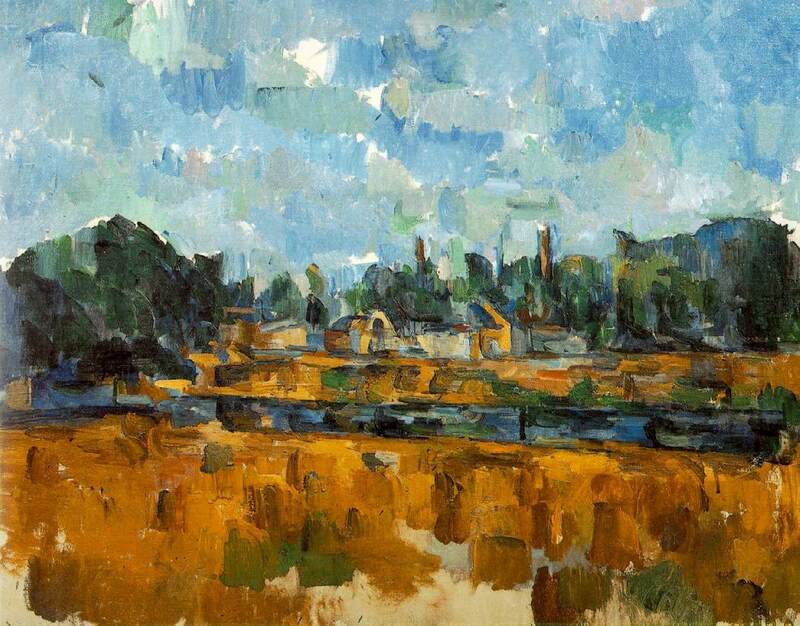 At first sight quite ‘advanced’ and abstract, Cézanne’s constructive stroke here accommodates many depth cues, and there is even some aerial perspective. What has often been missed, I feel, are the limitations imposed by the constructive stroke on what Cézanne could show in his paintings, and how objects could be depicted. Just as pointillist painting has a distinctive look because of its limitations, so Cézanne’s paintings developed their own look. However to attribute the radical changes that took place in the ‘truth’ of landscape painting in the twentieth century to Cézanne is at best exaggeration. In this respect I cannot see that he strayed beyond the limits articulated by Reynolds and Constable about a century earlier. Posted in Painting and tagged Cézanne, constructive stroke, depth cues, landscape, painting, perspective, plein air, realism. Bookmark the permalink.